Juan tour was amazing and memorable as we visited Santiago’s top sights giving us local insight into historical and modern sites alike. He was very knowledgeable and professional. Perhaps the most memorable parts of the tour were La Vega Central Market and Mercado Central, which in my opinion is the cultural heritage of the city. This indeed was an unforgettable tour as we explored Santiago, visiting legendary landmarks and impressive monuments in topnotch transportation with an expert guide. Our walking tour with Juan Carlos was truly a five-star experience. He made great suggestions while we were planning the tour, was flexible on the day of, and we got to visit three distinct neighborhoods all on foot as requested. The stop for Pisco Sours and all his knowledge about local culture history and politics were the icing on the cake. Juan Carlos was ready and waiting for our group on arrival. We had a great day touring Santiago. He took us to a local fish restaurant for lunch which everyone enjoyed. I wish we had not been so tired after our all night flight but it was a great way to spend the day until we could check into our hotel. Juan Carlos was very quick to answer any questions beforehand and made the planning of the trip extremely easy. I would not hesitate to recommend him to others. We had a wonderful day with Juan Carlos. He was flexible with the time and how we wanted to spend it. He gave us a thorough and very interesting tour of Santiago. We would highly recommend him!! 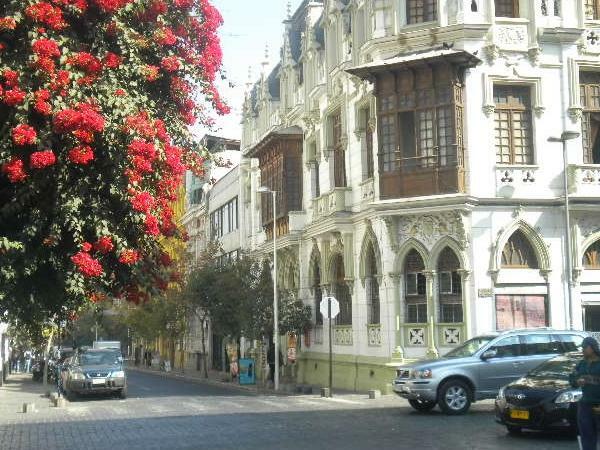 We had the Santiago city tour with Juan and we were happy with the arrangement and sightseeing that day. Juan met us at the airport and drove us to our hotel to have our luggage stored. We had Juan before on our previous trip, and with his knowledge and our prior communication, we were able to accomplish what we wanted to do that day. On return to the hotel, he also helped us to book a taxi for our return to the airport. We would highly recommend Juan to our friends who want a private tour in Santiago. Landing in Santiago at 08.30 after a (terrific- thank you, BA) 14 hour flight from London, we were whisked away in Juan Carlos' car at 11.00, & given an overview of Santiago, with great commentary. We felt we had a good grasp of the city. The focus of the tour was the amazing food markets - oh! and flowers! - of Santiago, stopping for tastes from the olive shop where JC buys his olives - fantastic! & a brilliant informed introduction to fruit sellers & fish mongers. Fabulous fish based lunch. Great guide. Wonderful tour by Juan. Everything went so smoothly from the hotel pickup to the Cable Car where we wanted to be dropped off. Getting to understand how people live and work in Santiago is so much better when not in an excursion bus or wandering intelligently, no doubt, with a map and guide to the city. The Santiago market must be about 4 football fields ..and all filled with fresh food. Great lunch at the seafood restaurant and Juan bargained with a local seller to get my souvenir hat. So much more! Juan Carlos is an excellent guide and ambassador for Santiago, Chile. His tour is very well thought out, showing the beauty & energy of this lively city. It was a wonderful introduction on my first visit here. I would highly recommend his tour. Muchas Gracias!! Friendly, knowledgable local who speaks great English. We're going with him again tomorrow for another tour! Juan Carlos was wonderful. Great tour 10 stars. TOUR GUIDE RESPONSE: Hi dear... Yes send me the pictures to my email Thanks for the lovely time and lunch..
Juan Carlos was prompt in picking us up at the airport. Our city tour was excellent, he's very knowledgeable and covers everything we wanted to see and do. He was able to answer our questions about politics, social issues, government and history. Highly recommended! Juan Gonzales was very knowledgeable about Santiago and the surrounds, speaks very good English and a very warm and friendly guide! Great tour day of beautiful Santiago with Juan! He was prompt, engaging, very knowledgeable and passionate about his city and country's history and future. Our mode of transportation was super. Tour was diverse, taking us all over Santiago, and immersing us in its everyday life and culture. Thanks for introducing us to Mote con Huesillo, Juan, we loved it! Juan was informative and was able to answer all of our questions. We really enjoyed our day with Juan! He is very knowledgeable about Santiago and we saw a wide variety of sites. Juan was very accommodating and we never felt rushed. I would highly recommend a tour with Juan if you are touring Santiago! Had a lovely afternoon with Juan Carlos. We saw a lot of Santiago and enjoyed the views and his knowledge of the city and its neighborhoods. Highlights included beautiful public parks, bustling markets of food, fish and flowers and delicious ice cream! Juan Carlos gave a tour that exceeded expectations! Not only was his command of the English language astounding, his knowledge of the history, geography, customs, and horticulture of the City and surrounding areas seemed to be inexhaustible. Juan Carlos was waiting when we departed the airport terminal; he was very attentive with a running commentary that even filled the necessary transitions travelling from one neighborhood to another.Thank you Juan Carlos for a truly memorable day! Thanks to Juan Carlos, we saw areas of Santiago which we would never have seen without his guidance. This gave us a real picture of life in this exciting city from different perspectives. Picked up at hotel, shown the highlights of the city and its districts from mountain estates, business district, bustling markets, churches and civic buildings. This is the niche of tours by locals, cramming the routine and the lesser worn paths of experience into a few hours. Juan Carlos knows the city and its history and provided an outstanding experience. Airport drop off for the red eye home, while still savoring the fresh fish lunch. Juan Carlos picked us up at the port and his car had plenty of room for our luggage. He had an excellent tour planned of Valparaiso and the area and then drove us to Santiago via a lovely wine area 'Casablanca'. We stopped for lunch and a glass of the Casablanca area's white wine. We got a brief overview of Santiago on the way to our hotel. Very interesting day. After a long overnight flight it was great to have someone in the airport to pick us up. (Pickup at the airport was just a little late, but it is difficult like any city in rush hour traffic.) Nice tour of the historic sites, and then took us to our hotel after. Juan Carlos was very prompt, friendly and spoke excellent English. He picked us up at the Santiago airport and took us to our hotel to drop off our luggage and freshen up prior to visiting the local fish and vegetable market and seeing other parts of the city. The tour was very informative and he accommodated our requests. Highly recommend Juan Carlos who is very knowledgeable and friendly. A pleasure to be with. Juan Carlos is terrific. Punctual, thoughtful, discreet, generous, flexible, extremely knowledgable on a wide variety of topics from history, to politics, art, current events and lifestyle. Well educated, well traveled and articulate. Relaxed, with a fine sense of humor. He tailored our tour precisely according to our requests, even revising the agenda as we progressed. Highly recommended. TOUR GUIDE RESPONSE: Hey Bill, you are awesome!! Thanks for the good vibrations and comment. Another great day with Juan Carlos taking in the sights of Santiago, especially the markets. Highly recommended. TOUR GUIDE RESPONSE: You are excepcionally generous on your comment, I really enjoyed your company while on tours. TOUR GUIDE RESPONSE: Thanks Carol!! Juan picked us up at the airport and gave us a whirlwind tour of Santiago. He is extremely knowledgeable and it is apparent that he loves his city. We had a lovely lunch. I would recommend him as a guide. TOUR GUIDE RESPONSE: Thanks figen, it's been my pleasure to show you around Santiago. Superb! That is the consensus among our four passengers that Juan Carlos was the best guide we had on our entire South American cruise trip. His English is excellent. He is very warm and friendly, and his breadth of knowledge regarding Santiago and its neighborhoods, architecture, and history is a must. Clearly we were highly pleased. Juan Carlos was the perfect guide. Knowledgeable, accommodating, professional and enthusiastic. We enjoyed his itinerary as we learned about Santiago. We would highly recommend him to anyone. TOUR GUIDE RESPONSE: Gracias Pat, It's been a privilege to have you as clients... God bless you!! Outstanding knowledge of the city and its culture. Personable and very caring about your happiness with the tour and the activities. Completely customize the tour and took me to a great lunch place by the Central Market. Excellent, very knowledgeable guide, and pleasant tour. Juan Carlos is an excellent tour guide, very knowledgeable and very willing to customize the tour to our request. We very much appreciate his driving skill in the busy city traffic. We loved our time in Santiago with Juan Carlos and would highly recommend him to our friends. Thanks. TOUR GUIDE RESPONSE: thanks so much Elvan, I really had a great time with both of you during your short visit to Santiago... Congratulations one more time on your 50th wedding anniversary. This tour was most enjoyable. Juan Carlos picked us up right on time at our hotel and took us to all of the diverse and interesting neighborhoods and landmarks in Santiago. He was very friendly and considerate as well as being fluent in English. We shared many interesting conversations as well. The huge market was definitely a highlight. He made us feel as though he enjoyed our company as much as we enjoyed his. The four of us all agreed it was a great day. TOUR GUIDE RESPONSE: Thanks Barbara!! Very comprehensive tour of Santiago. Lots of good information! Juan Carlos was extremely friendly, informative and knowledgeable. He provided an excellent insight into the various facets of Santiago and took us to many places you would not see on a normal bus tour. Spoke very good English and was good company. He was happy to go the extra distance for us. TOUR GUIDE RESPONSE: Thanks David; I really enjoyed your company while touring Santiago... Cheers!! Juan Carlos is a very good guide and we have enjoyed touring with him. He is quite knowledgeable about the history of Chile and its main two cities. However, we specifically wanted to visit Jewish sites in Santiago and Valparaiso and he failed to make the proper arrangements that were required in order to gain access to these sites. Also, his knowledge about the history of Jewish life in Chile is limited. TOUR GUIDE RESPONSE: Unfourtanely Jewish sites require special notice in advance to be visited so when I called them the day before to set the visit up, no one got back to me with an answer to confirm that visit... I never heard of such restrictions and codes before. Juan Carlos also was the best tour guide. He took us to so many wonderful places in Santiago. The visit to the markets and lunch afterwards unforgettable. His professionalism and knowledge of the area was most impressive, and helped to make Santiago the highlight of our South American Holiday. We will never forget our experience in Santiago with Juan Carlos. TOUR GUIDE RESPONSE: Thanks very much James; it was my privilege to be your host in Santiago..
Juan Carlos is wonderful,very personable,we had a great time,totally enjoyed the company and sightseeing!Very highly recommend him! TOUR GUIDE RESPONSE: Thans so much Eleaonora!! TOUR GUIDE RESPONSE: I really appreciate your comment Shawn... Thanks a lot!! Juan Carlos met us at the airport which was awesome as we were incredibly jetlagged. He was super knowledgeable and knew his was around the city like an expert! He would drop us off to explore and was prompt in picking us up. He is a very friendly guy, speaks English well and was happy enough to teach us some Spanish. He led us to a great lunch, dessert and coffee. We'd highly recommend him. Juan Carlos picked us up as scheduled and we had a good tour of the various sectors of the city. We had a great place for lunch and a nice time. English was no problem at all. Carlos even was able to take us to the airport late that same night which was really convenient for us. Juan was very flexible, informative and friendly. Spent extra time to sort out when there was some fake currency issues in the airport. Enjoyed the time. I have been to Santiago 3 times but it was my husband's first visit there. We wanted to see and learn more about Chile's largest and very great city. Our guide, Juan Carlos, picked us up at our hotel and for the rest of the day we were treated to an insider's tour of Santiago. His itinerary was excellent but he was agreeable to add a couple of extras that we requested. We drove, we walked and we talked throughout the city. His English was perfect and he was very generous with his time and knowledge. Juan Carlos collected us from our hotel on time, in a spotlessly clean,comfortable vehicle. He tailoured our tour to suit our interests. We toured to the Maipo Valley, stopping at various places to see and experience the countryside at the foot of the Andes Mountains. A very special lunch at a restaurant set in a picturesque location. We sampled a variety of bbqed meats with local salad and potatoes, accompanied with Chilean wine and beer. Traditional music playing and dancers. Perfect day! Juan Carlos was fantastic- he arrived on time in a meticulously clean and comfortable vehicle.He tailored our tour to exactly what we wanted. His knowledge and wonderful English made our tour enjoyable ,exciting and laced with humour. Nothing was too much trouble. We could never have seen as much, experienced as much or understood as much of Santiago ,its history,culture, people and food if we were not guided by Juan Carlos. We ate a typical Chillean "lunch", sampling beer and wine - magnificent! Excellent personalised tour of Santiago by an extremely knowledgeable guide who was able to communicate clearly in English. His understanding and enthusiasm for his country's history, culture, industry and its political structures was excellent. Very impressed. We had an unplanned night in Santiago so rather than sit in a hotel room I decided to take a tour with Juan. My previous impression was Chile was a third world country - I came away with a completely different point of view. Money well spent. very knowledgeable and helpful. we saw a lot. the ladies in the group would have liked to shop a bit more. We would use Juan again. Juan Carlos was absolutely superb; we could not have asked for better. He arrived punctually, his command of English was superb. We had a personal small schedule problem which he took into account without saying a word other than "Not a problem." We saw what we were interested in and learned much of the history of Santiago, both remote and more recent. In regards to the more recent history his presentation was balanced. We would recommend Juan Carlos highly. Juan responded to my email inquiry right away when setting up the tour. He met us right on time at our hotel and tailored our outing to the New Year's holiday and to our tastes. He knows Santiago, tourism, and English all very well. He showed us the beauty as well as the tragic sides of Chile's history and politics. As a result of his taking us on a tour of Santiago, we were able to return to more places and see more city sights via subways etc. This was our first toursbylocals, we are fans! Thanks Juan.